Riccoferro is built on a hill rising out of the Avernine. An iron mining town, it is split into six fortified zones like a giant spiral stair part carved into the hill leading to the Avernine, Bacino and the Fiumorte and the morass of Oroguida. Relentlessly grey, Riccoferro hums and vibrates from temple bells ringing over iron-masked soldiers in plate and mail riding steel-shod hooves over cobblestones over tunnels housing ringing trip hammers and stamp mills. This place breeds ambition, paranoia and a malicious streak. Seeking to elevate themselves to tiers where underground waterwheels and hammers are unneeded, they scheme tirelessly. Cautious yet implacable, the idealised Riccoferran has an eye on the prize and plans for almost any contingency. This attitude is exemplified by the soldiers who provide martial law, called ironmasks by the locals. These rule by fear, brutality and constancy. Temple Street runs the circumference of Riccoferro and gamut of architecture with a thousand beliefs. Almost every building here is a temple or shrine save the gates to Avernine, Animardente and the locks to Bacino. An equator of elaborate temples jostle cheek-by-jowl. Prophets true and false harangue passers-by. Temples to heresies and schismatics selling indulgence and benefice are neighbours with more orthodox faiths. Discordant chanting and invective can overwhelm sensitive ears. Fighting regularly occurs and is suppressed by ironmask brute squads with flanged maces and tower shields. The first and highest zone, Rutuonis, rises in the northwest but cannot be reached by the Avernine gates or Bacino. Looming over all of Rutuonis is the Spike. Artisans and finesmiths line Rutuonis and the average citizen wears more gold and jewels than iron. Ironmasks here wear a surcoat of grey wool with a red scaled bull to their plate mail. Statues of snake-haired furies with sweeping wings keep vigil from towers and townhouse roofs. As a deterrent against burglars, these are most effective. The Spike is an iron-shod citadel and prison that impales the sky at the heart of Riccoferro. No building is taller and from it's solar, the local patrician, the Iron Constable observes his domain. Those trying to build higher than the Spike are condemned to death. Ironmasks leading convict labourers tear down buildings and tear apart builders between warhorses. It's said the Spike's cells lie under Oroguida's cesspits and Chantákia's strip mines. The second zone, Settentrion, houses the northern Avernine gate. Ironmask garrisons at the gate, western wall and the base of the Spike make this zone orderly. A smithy row from armourers to farriers sells soldiers the tools of their trade. Finesmiths unable to get Rutuonis gold sell jewellry in brass, copper, pewter and glass. Assassins and sorcerors sell subtle death away from the garrisons. The third zone, Marmorbis, is known for a great coliseum where athletic and gladiatorial games are held to delight jaded appetites. Schools and stables predominate with an influx of newly-built iron ore mineshafts sunk into the hill away from the Spire. The ore is processed in Orien, older residents are furious at ore wagons taking up their roads. A narrow gatehouse, the Centaur Gate on Temple Street overlooks Animardente's slopes. It's fortification and narrow entrance is such only a small garrison is needed. Here the Riccoferran mean streak takes the form of flattery and manipulation. Ironmasks are fewer here yet command fearful respect from locals by harsh judgements. They wear a surcoat with a white circle emblem. The fourth zone, Orien, houses the eastern Avernine gate. The gate is heavily-garrisoned as is the base of the Spike. The ironmasks take special care of Orien for the subterranean ironworks Riccoferro is famed for are based here. The trip hammers and stamp mills never stop, the incessant noise drives some deaf, mad or suicidal. Others drown the noise and vibration out with vices. Wealthier iron miners are moving to Marmorbis so an influx of new blood is happening. Iron is shipped out from Perlanero or the Avernine gate. The fifth zone, Perlanero, has three locks to Bacino along the south face of the hill. 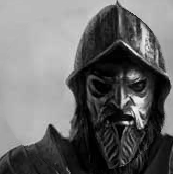 Ironmasks here wear a grey surcoat with a black sea horse and have garrisons at each lock and the Spike. Rats are ubiquitous,. Warehouses of iron bars, brass and copper jewellry, bales of wool and sailcloth await the boats to Bacino. Myriad waterwheels under Perlanero's cobblestones carry water into the bowels of Riccoferro up towards Orien and the Spike. In autumn, chill mists cloak the slave markets flush with a season's takings. The final zone, Occidua, houses the western Avernine gate and a gate to Oroguida. Ironmask garrisons built over convict-powered waterwheels stop flooding. Gloomy, muddy cobbles are treacherous underfoot. Labourers and hemp-growers provide most wages with ropes and fabrics leaving the Avernine gate or via Perlanero. Exiles from Riccoferro or other parts of the city sometimes linger here before fleeing into the Avernine. Ironmasks stay in their garrisons but if roused crush any resistance. A dozen disgraced ironmasks have turned vigilante gang. These rustmasks are the nearest thing to populist outlaws Riccoferro has.